It’s also noteworthy that Batman’s injuries don’t do much more than keep him out of the next scene, and he’s back in fighting trim for the rest of the episode. Wonder Woman charms the location of the Philosopher’s Stone out of Harv Hickman, but Morgaine shows up to claim it. After missing Wonder Woman with five mystic blasts, the sorceress transforms Hickman into a monstrous worm creature that smashes Diana through a wall with one hit, an effective change in tactics. Were Le Fey’s initial blasts all separate actions or parts of one or two actions? Likewise, it seems like Wonder Woman is initially focusing on defense—what some game systems would call “full defense,” where she sacrifices her other actions. Flash is easily able to avoid the worm’s attacks, until the complication of saving an endangered party guest arises. Then the worm is able to knock him for a loop, leaving him stunned. Wonder Woman swoops in and strikes five quick blows that stun the creature, then lassos it. (Again, a series of quick attacks—a singular action or a series of actions?) Morgaine seizes the opportunity to try and levitate the stone away with magic at least as powerful as Wonder Woman’s considerable strength, but the Demon interrupts with an attack that breaks Le Fey’s concentration. Interesting to note that, when told to get the stone as far from Le Fey as possible, Wonder Woman flies off rather than handing the stone off to Flash (who could certain get farther faster), instead entrusting Flash to make sure innocent people are clear of danger. Le Fey takes out Etrigan in just a couple of attacks, leaving Flash to rush the Demon to safety as well. On board the Watchtower, Le Fey sends her ogres to attach the League, while at the same time exerting her influence over Martian Manhunter. J’onn’s struggles take place alone, which means they could be traditionally narrated player-GM interaction, or they might happen entirely “off-stage.” Certainly, the influence Morgaine exerts is classic compel/complication territory, perhaps with J’onn’s player racking up some points because of it. Note that the ogres attack en masse and effectively function like a single opponent capable of fighting all four of the heroes present in the Watchtower. They’re not really differentiated, and they don’t suffer “damage” as a group until the heroes defeat them all. 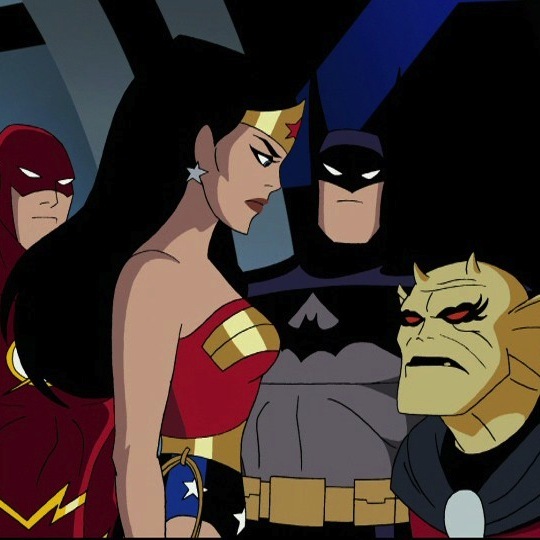 Flash’s “How many of these things are there?” question echoes Batman’s “There are too many of them!” from the previous episode, suggesting an “Overwhelming Horde” kind of aspect to Le Fey’s minions. Flash and Etrigan finally overcome the ogres with a combined power stunt: a freezing maelstrom. Note that it’s an area effect that takes down the ogres, with a descriptor opposite of the Demon’s usual hellfire (which the ogres seem largely immune to). Again an example of switching tactics when traditional ones prove ineffective. Etrigan’s “The Martian is gone … and so is the stone” could easily be a declaration from the player or GM of J’onn’s disappearance if the whole struggle happened “off-stage,” with the action focused on the heroes fighting off the ogres. Note that little is made of the League teleporting into Le Fey’s stronghold: It’s just a quick plot device to get them off the Watchtower and back into the action, essentially a “zero sum” of an award for the complication of being stranded and the “stunt” of teleporting out. In the end, the Leaguers and the Demon fall to Le Fey and the Martian Manhunter, acting under her influence. (Note this is one of the few times in the series where J’onn uses his density powers to become super-dense to resist the Demon’s attack.) It comes down to J’onn finally resisting and rejecting Morgaine’s influence and destroying the Philosopher’s Stone, causing Le Fey to withdraw from the field of battle, at least for now. Just a Few Hits: There are a number of instances where heroes get taken out in just one or two hits. Admittedly, Flash is just stunned by being slammed by a giant monster, but Le Fey takes out Etrigan (a pretty tough guy) in two blasts. In spite of a dislike of being “one-punched” amongst players, a game system tends to need some kind of option of that type, even if it is a fairly rare occurrence. On the other hand, Batman’s quick recovery from his injuries shows that superheroes should also bounce back fairly quickly, especially if the story calls for it. Complications = Stunts: This episode, in particular, is a good example of the formula: Complication = Stunt, where a complication or challenge grants the players a resource and they immediately spend that resource on a stunt or novel action to deal with that complication, since part of the complication is the their normal resources are not sufficient. The League being stranded on the Watchtower, but combining a target lock on the Javelin with the Demon’s mystic powers to teleport to Le Fey’s stronghold is one example. It all comes out in the wash, since the complication is immediately spent on its solution. This technically violates the guidelines of a game like M&M, which says hero points from complications can’t be used to negate the complication that caused them, but it could be use of a pre-existing hero point, or just a “trade-off” where the complication is effectively negated and “doesn’t happen”. Not All Struggles Are Fights: J’onn’s mental battle with Le Fey and her temptations is a key part of this episode, and his rejection of her is the big payoff at the end, so the ideal game system for handling this type of story should have some kind of system for struggles and conflicts other than strictly physical fights: the interaction skills and Will resistance checks of M&M, the success pyramid of ICONS, or Marvel Heroic’s mental and emotional stress tracks are all examples.